What do the wrist watch, cable television and Luke Armour have in common? That’s right. Eventually they all go digital. Update: I thought I’d get a little more specific since I’ve been on the job for a week now. Part of FH’s commitment to digital is providing full-service and integrated digital media solutions across traditional, online, experiential and mobile channels. We provide social media counsel, training and outreach to and on behalf of our global clients. I was brought on, in part, for my experience with podcasting and blogging, but our work covers online communities, social networks and many other social media initiatives. My role is focused almost exclusively on helping to develop social media strategy and executing it. This is going to rock. I’ve really been impressed with Fleishman’s commitment to digital communications the last few years and with the people on its team. Over the last few months I’ve had a chance to interact a bit more with some of the locals. I’m pleased to be joining technomarketer Matt Dickman, tradigitalist Nader Ali-Hassan and Lynn Eastep, who is really her own adjective – and those are just the brainiacs in the Cleveland office. Fleishman has digital specialists located across North America, Europe and Asia, including strategists, developers, designers and online communications experts. I’m thrilled to be joining such a powerful team. 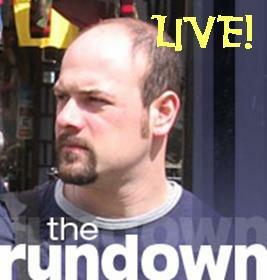 This will be my last week at BlogTalkRadio, but I’m sure to fire up The Rundown occasionally. I also want to thank the team at BlogTalkRadio for their friendship and opportunities. I wish them all the best of luck! I’ve a bit of a drive ahead of me, so podcasters – you know who you are – get your call in lines ready. Luke — We’re really looking forward to having you on the team here. Welcome! Awesome news for you and FH. Congratulations Luke! Congrats mate! FH got a good one, shame I could never tempt you and the FAM into an NYC move! Does this mean you’ll turn into a boring corporate suit by our Podcamp Ohio session? I hope so, need a straight man. Congratulations on the new job, thanks for the facebook notes! Congratulations, Luke! Great news. They are very lucky to have you. :o) Have fun and enjoy the new challenges. Congrats to both you and FH Digital, Luke! Thanks for all the well wishes. It’s good to see that even in my lowest output of blogging, people still read this – and so quick! Paull – you are not funny. When are you going to realize that? Hey Luke– sorry about the f’ed up comment before– sent that from my not-so -smart phone. I’m amazed it went through to be honest! We can’t wait to get you here!! Congrats Luke, keep us posted! Congrats, Armour! Looks like you’ll be in the perfect position to stop by a certain favorite spot in downtown Cleveland for cheese soup DAILY. Rock. Great news, Dude. You and Matt should made a great team, but at $4 a gallon, you might want to renegotiate the deal! Sorry, Matt. I’m always telling the young professionals to ask for more money! Best of luck, Luke. Hi Luke! I hope you’re having a great first week in the Cleveland office. Let me know if you need anything! Hope you’re enjoying your second week at FH… we’re so glad you joined us. BTW, I am “my own adjective”? That made me laugh out loud. What, you never got daily jazz hands at BlogTalkRadio? Doug, no worries. Although I was bit curious. Bill, you old dog. I had already signed the paperwork when you left your comment! I should consult with your more often. Kait, you couldn’t be more right. I look forward to shepherding in a new lunch routine. Betsy, so far so good. Lynn, it’s the odd combo of jazz hands and “eye of the tiger” that’s new for me. Everyone, thanks for the warm fuzzies. See you in the internets. Just saw this. Great you have you. Come visit us in DC! Your new FH Digital friends across the pond welcome you as well. Can’t wait to work with you as well. Luke — was checking in old fav web sites and read of your move. Congrats! Don’t forget us ‘down south’ in Akron.